Jan - 05 | By: NW Film Center | no comments. 16mm Cinematography with Scott Ballard starts January 19th! Register online today. 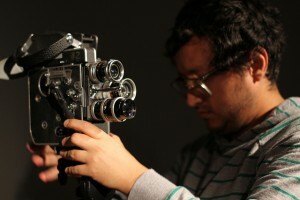 Analog filmmaking is back at the Northwest Film Center! After an almost five-year hiatus, we’re excited to offer 16mm Cinematography again and this time with local Director of Photography Scott Ballard (DEATH ON A ROCK, THE BLACK SEA, HIDING BLAME). The nine-session course will give participants the opportunity to try out different 16mm film stocks (both black & white and color) and even different cameras (Bolex and Arriflex-S). Working in groups, students will complete projects in order to learn about lighting, blocking, and framing. Bring your basic knowledge and skills in photography and apply them toward working in wonderful 16mm. Tuition includes all the film stock, processing, and digitizing necessary to complete your assignments.